Muddy says: Fancy tying the knot somewhere with proper historic pedigree? This Grade I-listed pile was once a hangout for Henry VIII no less – his ghost sometimes even swings by. Fancy tying the knot somewhere with serious historic pedigree? This stunning Grade I-listed building on the Buckinghamshire/Herts border, was once visited by Henry VIII and Queen Elizabeth I, accompanied by their Courts. It’s said ghostly footsteps are still heard some nights crossing the gallery; possibly those of Henry himself towards his then queen, Catherine Howard’s room? The gardens here won the Historic Houses Association Christie’s Garden of the Year Award 2009. In their present form the gardens are divided into a series of compartments, with various colour themes and structural forms, combining imaginative plantings and beautiful plant associations. 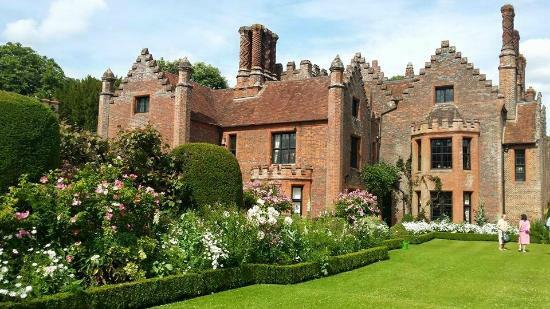 Chenies Manor can be hired for weddings or as a filming venue, and is open to the public for parts of the year (check the site before heading out).